Renegades of the Empire is a 1999 book by Michael Drummond. 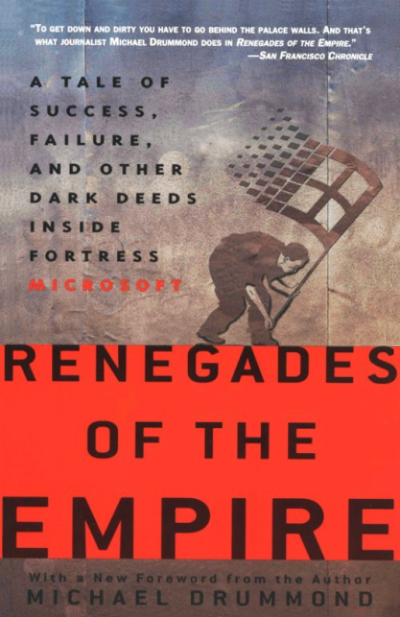 Renegades is an odd book, focusing primarily on a small political faction within Microsoft and two projects with which it was identified. Drummond’s LinkedIn profile lists as an accomplishment, “Managed Shiite, Sunni employees as Baghdad bureau chief at the height of the U.S. military surge,” so presumably he knows something about in-fighting! Specifically, Renegades focuses on Alex St. John (eventually CEO of WildTangent), Eric Engstrom (eventually CEO of Wildseed), and Craig Eisler (now a Corporate Vice President at Microsoft, and former blogger) through two projects, DirectX and Microsoft Chrome/Chromeffects. If you’re a PC gamer, you’ve heard of DirectX, a multimedia technology that many games use to have more lifelike graphics and sound. Almost no one has heard of Chrome/Chromeffects, initially an advanced browser, and finally a bucket of technology subsumed by other groups. The political machinations that occur in the background continue to impact the company, such as the rise of Jim Allchin (who became head of the Windows group, only to resign the day Vista shipped and is now a musician) and the ever-increasing importance of Steve Ballmer (now the CEO). Crystal Fire, focusing on Bell Labs, is an analogous story of three men attempting to push their vision on an organization. Against such fine competition, Renegades comes up short. While I Sing the Body Electronic finally differentiates between characters and explores the link between personality quirks and project fates, Renegades focuses on three stereotypical alpha nerd. Microserfs, similarly set in the mid-1990s, features much more sympathetic protagonists. Crystal Fire, exhaustively researched and with the benefit of historical context, charts the rise of an entire industry. Michael Drummond has had an excellent career since Renegades of the Empire, and I would be fascinatined if he came out with a second book. Considering the heavy competition in the niches that Renegades occupies, however, it is difficult to recommend this book.